I liked this blog entry from Planet KDE. That entry reminded me to talk about one way I like to think about how to improve the user experience with software – and that is by what I call the “forehead mashing” method. This is where as you’re developing software, write out a few problems that you’re trying to solve. Then, for every step the user is required to make – for every dialog that pops up, for every few seconds of keystrokes, every dialog to click, every checkbox to check…lower your head onto the desk and hit your forehead. You don’t have to do this with a lot of force. Just enough so that you feel it. One of the top things that will quickly make your forehead sore are Wizards/Assistants. The way I think of these is that the programmer is so proud of their work and they think it’s so awesome and complicated that they want you to acknowledge it. What if programmers inflicted these kinds of things on ourselves? 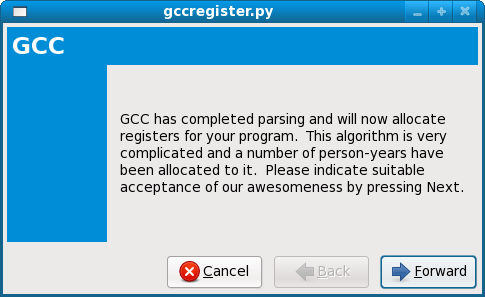 Say in gcc. It’s not just wizards of course that are the source of pointless user time spent reading text and clicking buttons; random dialogs are another source. Often with some thought, it’s really not hard to reduce and simplify. So I promised in the comments in my previous post that I would do something to reduce the pain from the notification bubble I added; to keep the universe in balance as it were. So I’m happy to say that in Fedora rawhide now, the above dialog is no more. It was just a bad idea, and you will never see it again.